When I was a little girl my fondest memories are of baking in the kitchen with my Mom. I’d stand on the chair pushed against the counter and lean over to help. It feels like I learned how to measure ingredients before I could walk. 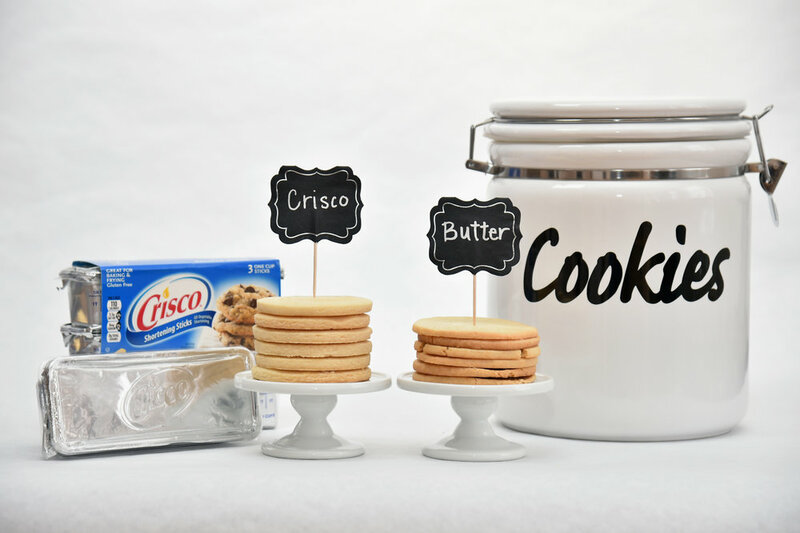 They were the best cookies and we always used Crisco® All-Vegetable Shortening. They were soft, fluffy and noticeably better than cookies baked with butter. Every year around the holidays we would host a cookie exchange where friends and family would come over and bring several dozen cookies to share. It was the best because we’d get to try tons of different cookies. And everyone would ask what our secret was to making these beautiful, moist, fluffy cookies and we would tell them it was the Crisco®. My Mom’s sugar cookie trees were always super popular, followed by her butterscotch bars. I could never choose a favorite because they were equally delicious! This recipe is inspired by both of those cookies. 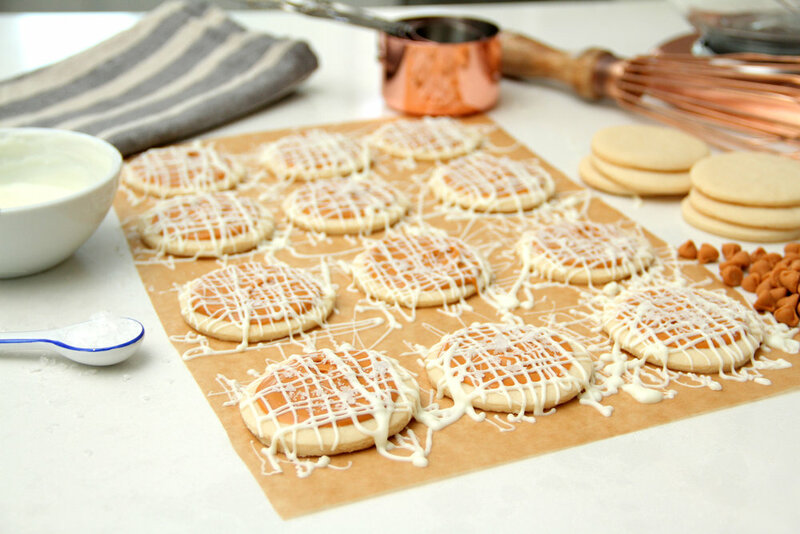 It has that warm familiar flavor of brown sugar and creamy white chocolate with the soft light-texture sugar cookie complimented all by fleur de sel which acts like electricity through the entire cookie. It’s one of those cookies you can never have just one. It’s so good I could cry. It’s like when you run into an old friend and a flood of good memories come back and you wonder why you ever stopped being friends only to discover you can’t remember why and that feeling makes you sad. If that feeling was a cookie, this would be it. Yes, I’m being serious. It’s not a sad cookie. It’s like a time capsule cookie that brings you so much joy you just want to hold on to it forever because the feeling is so good and you don’t want it to go away again. That is this cookie. This is the only way to describe my Salted Butterscotch Sugar Cookies. You’ll actually want to apologize to it because it’s so good and it did nothing wrong for you to forget it’s amazing qualities, despite never having it before. I’ve never met someone that didn’t love this cookie and try to stuff a couple in their pocket before leaving. Long after the party is over people will find a reason to bring up this cookie just so they can talk about it and reminisce about how good it is. I’ve had people offer up their first born child in exchange for this recipe. Ok-maybe not that far….but you get the picture. This is why this is the only sugar cookie recipe you need. Scroll down to salivating city and then run to your kitchen and bake these immediately. Be sure to tag me on IG @BrandiMilloy with photos of your Salted Butterscotch Sugar Cookies! HEAT oven to 350°F. Whisk flour, baking powder and salt in medium bowl until blended. BEAT shortening and sugar in large bowl with mixer on high speed until light and fluffy, about 5 minutes. BLEND in egg, milk and vanilla. Gradually blend in flour mixture. DIVIDE dough in half. Roll out each half on lightly floured surface to 1/4-inch thickness. Cut with 2 ½ inch round cookie cutter. Place 2 inches apart on baking sheet. Bake 8 to 10 minutes or until bottom edges are very light brown. Cool 2 minutes on baking sheet. Remove to wire rack to cool completely. To decorate: Spread butterscotch on center of cookie. Drizzle white chocolate on top and garnish with a sprinkle of fleur de sel.